Conducted By Instructors Tom Tucker, W.G.T.F. 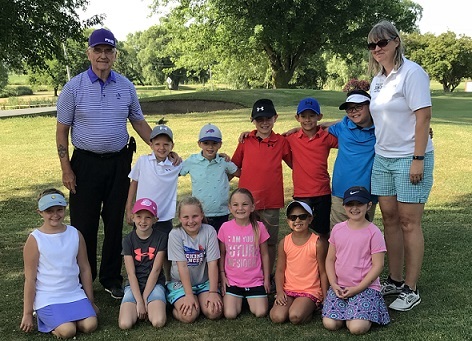 "Top 100 Golf Teacher"
Please note that next year we'll be changing the age groups to Junior Division Ages 7-10, and Senior Division Ages 11-15, with Boys and Girls Divisions in each age grouping. The Friday Tournament saw Owen Glazier dominate the boy's division as he medaled with a score of 29. The girls divison was a close contest, with Riley Yunker prevailing by 2 strokes over Roane George. This was Riley's 2nd Championship Medal in two years! 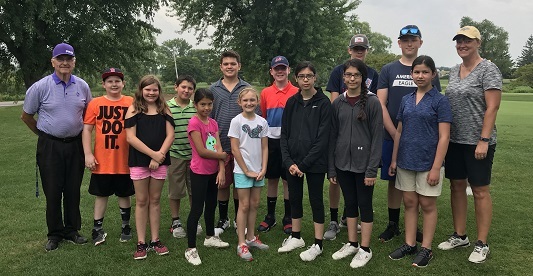 Closest to the pin winner on hole 13 for the boys was Ryan Muscarella, and for the girls it was Lily Davis. 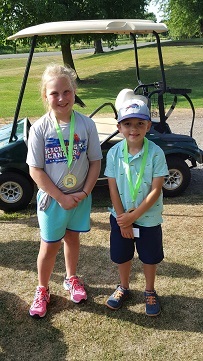 Closest to the pin winner on hole 17 for the boys was Ryan Muscarella, and for the girls it was Lindsey Betters. The long drive winner for the girls on hole 14 was Michala Falkner, no boys hit the fairway. 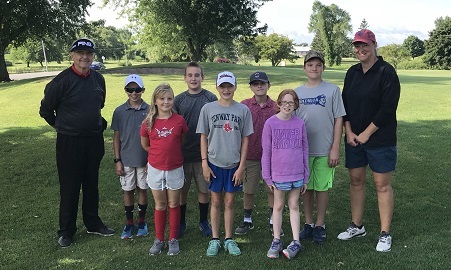 Aimline Accuracy - Boys - Tyler Roth, Tyler and Lily got into coach Tucker's wallet for a few bucks for themselves and their fellow golfers. We had some high drama at the Friday Tournament. Will Fulton and Sam Dinsmore tied with a score of 39 and we had a playoff from 100 yards on hole 18. Both boys hit the green with fine shots, and Will Fulton prevailed with a birdie. In the girl's division, Amelia Frens shot a 44 to edge out Jada Fite by one stroke. 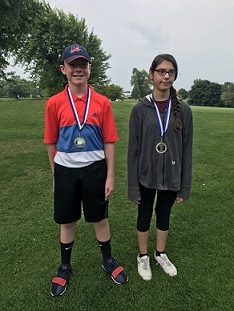 Closest to the pin winner on hole 13 for the boys was Sam Dinsmore, and for the girls it was Riley Prunner. Closest to the pin winner on hole 17 for the boys was Brennen Pederson, and for the girls it was Emily Frens. The long drive for the boys was Sam Dinsmore, for the girls it was Jada Fite.